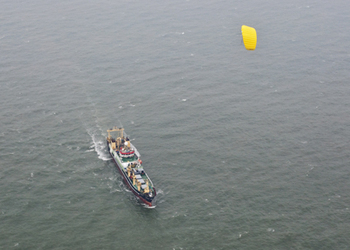 The SkySails-System was successfully placed into operation aboard Germany’s largest fishing vessel ? the ROS-171 “Maartje Theadora” ? on the North Sea near Ijmuiden, Netherlands on March 8th, 2010. This innovative SkySails wind-propulsion system will henceforth help save large amounts of fuel and emissions. The maiden voyage of the ROS-171 “Maartje Theadora” with SkySails propulsion, which will take the ship across the Atlantic to South America and then into the South Pacific, heralds the use of regenerative energy sources in deep-sea fishing.